Hurrah! It is a warm and bright morning, and you are out digging in the miniature garden. The sun shines down on your miniature plants and fairy garden accessories; there is no better spot to be. The feeling of visiting your oasis when everything is in its place—miniature trees planted, flo wers blooming, and fairy houses settled in their appointed areas - is one of the best sensations in the world. That is why it can be a little unsettling and even nerve-inducing to think about introducing a brand-new fairy into the miniature garden that you have already so lovingly crafted, cared for, and positioned “just so.” However, there is nothing at all to fear! With the right attitude and a couple of tips, you will be on your way to incorporating fresh fairies and new friends in no time at all. The fairy world is populated with wee friends of all types and characters. In your miniature garden, you might have fairies involved in a number of different activities. Some fairies love to garden in the vegetable patch, while others play the day away. Still, others might like to sun themselves on rocks or sit at tea tables. 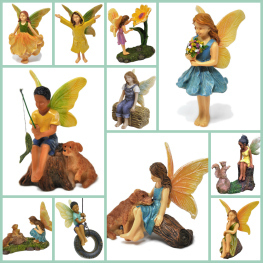 One easy way to incorporate an additional fairy into the miniature garden is to choose one that has a particular scene or fairy garden accessory to go along with it. A loyal canine friend, inspiring a new area themed around pets, and furry pals might accompany a fairy. On the other hand, you may find an adventurous fairy who is swinging from a tire swing. This type of fairy could fit right in with the miniature trees and miniature plants you already have—easy! Alternatively, you could build an entirely new scene with your latest fairy. Think of one that is creating a sandcastle or holding a fishing pole. You will want to give those fairies a beach or lake in which to play. Fairy garden accessories that are attached or accompanying fairies can make it simple to establish a new area or re-imagine a miniature garden you already have. Choose a fairy who comes in a set with friends or relatives, and you have double the fun. While some fairies are paired with fairy garden accessories that add interest and excitement, others stand out all on their own. A fairy that is “flying solo” without an accessory or friend can often be extra expressive when it comes to a particular emotion or personality trait. Think of bravery, exhaustion, playfulness, or love. Fairies can exude emotions in the garden that help us share specific feelings and situations with visitors, or even prompt us to connect with our memories, dreams, and beliefs. To share the good news about your new garden fairy or fairies, you can create a corresponding theme area, add miniature houses for your new residents, or weave the fairies into areas that already exist. To highlight the garden fairy, you could also add a new strain of miniature plants, landscaping materials, or even miniature trees. Let the fairy’s expression, personality, or accessory offer inspiration towards finding his or her place in your miniature garden no matter how you plan the space. This blog post was published on 01/23/2019 17:42:36.